Just when we thought new media might help revive democracy by mixing blogs, forums, online polls and the like in with more traditional meetings, broadcasting and print we find the territory has shifted again. We should be looking at online gaming and virtual worlds, because that's where tomorrow's citizens are spending their time. That anyway was the pitch tonight from Jo Twist, former BBC technology reporter and now heading up the think tank IPPR's Digital and Media Society programme. She was contributing to a New Stateman event 'Politics and New Media: where next?'. Jo gave us a stack of statistics from BBC research showing that enormous numbers of young people and under 30s are spending lots of time interacting with other young people online. That's where they build their social networks and create content. As one said: "games put you in control". 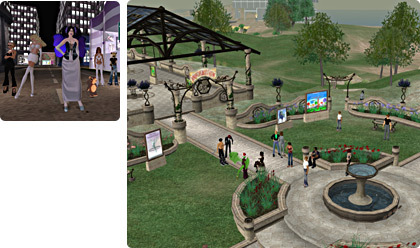 Virtual world environment to offer government entities and interest groups an on-line space for conducting citizen consultation. In short, this project will use the metaphor of the “county fair,” a familiar civic event in the life of a community. This will be a place – like a meeting tent, a town hall or even a shopping mall – where groups can congregate online. The aim of this project is to design a space where interested parties, such as trade associations, activist groups and scientific experts, will be able to set up virtual booths for presentation of information and deliberation as well as advocacy. Jo's point, as I understood it, is not simply that we have to move democracy online because that's where lots of people are. It is that games and virtual environments provide a model of the real world - its roles, events, procedures, ownerships - but much speeded up. I think I heard her say that the 'real world' processes of deliberation are just too slow. And (I believe) you can learn how to improve relations with your neighbours - http://neighbourhoods.typepad.com/neighbourhoods/2005/06/the_future_of_n.html. I daresay there is already research confirming that many people who game online already know one another and meet face-to-face? There is some evidence, which Jo alluded to, that gamers back-up their online communities with real life meets etc.. There's also, and I think this is where this gets interesting, a body of work that talks about how people represent themselves online in these communities, and how this differs from how they represent themselves in real life. Lots of research has gone on into how people represent themselves in face-to-face deliberations (whether at planning meetings or discussions of the future of cloning, say, where, eg they may try to posture themselves to be the expert) and there's some work going on into online deliberations. And I think I'm right in saying that people often feel more open online than face-to-face or by phone, because of the different meeting dynamics. Where I think Jo's point gets exciting is if we could combine some sort of representative deliberation in comfortable digital environments and apply them to tricky issues that affect young people. "Where I think Jo's point gets exciting is if we could combine some sort of representative deliberation in comfortable digital environments and apply them to tricky issues that affect young people." I think this is absolutely right. Where new solutions can be about adding to the sum of human knowledge and providing new evidence, they are bound to be worth exploring. I was particularly interested in the way this discussion was focussed on deliberation, and not the usual sterile ground of how like-minded individuals can be networked and can use new communications tools to campaign.